Many Chinese New Year decorations are based on the lion dog with his full gold mane. Chinese dancers mimic the movements of a lion dog in a New Year's Parade. 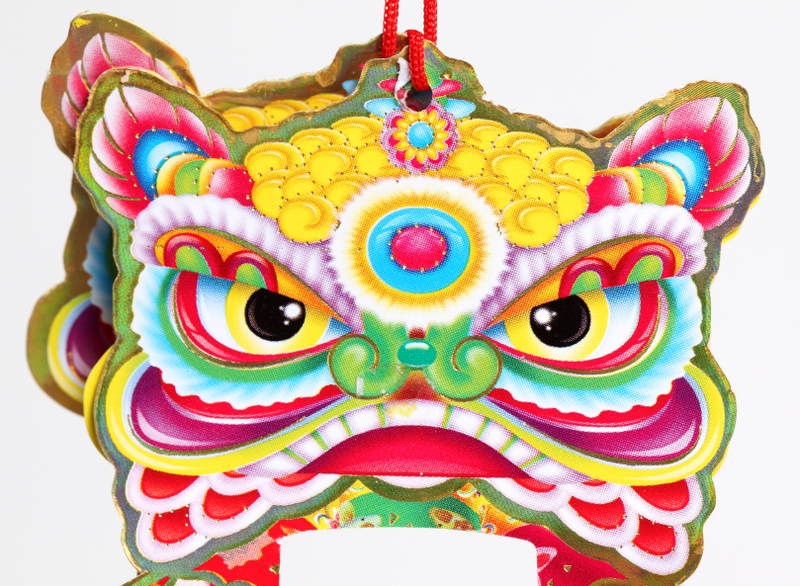 Lion dog decorations are based on a myth in which a monk was told that a lion would provide protection from a variety of plagues and evils and summon good luck and fortune. Chinese people had never seen a lion, but the monk created a lion by combining all of the magical and lucky animals he could recall. The Chinese zodiac plays an important role in each New Year's celebration. The year 2010 was the Year of the Tiger, and 2011 will be the Year of the Rabbit. Signs of the zodiac are used everywhere as Chinese New Year's decorations. They appear on calendars, banners, paper cut-outs, coins and on many other decorative items for the new year. In addition, greeting cards are sent that feature the zodiac animal for a specific year. Chinese lanterns are one of the most common Chinese New Year decorations. The Chinese Lantern Festival, or Yuan Xiao Festival, is associated with New Year. Although the festival falls on the 15th day after the first moon and is the night of the full moon, lanterns hang everywhere during the entire New Year period. The lanterns add to the brilliance of the full moon and make people happy. They are typically made of pleated, translucent paper and are colored red decorated with gold. Lanterns are hung along streets, in home gardens and in party rooms where they add a warm glow to the festivities. Red envelopes make up part of Chinese New Year decorations. Besides being decorative, they are highly prized by children because they are used to deliver money gifts from family members and friends. The older the child, the greater the amount of money in the envelope. The custom of giving money in red envelopes has become so common that employers sometimes deliver New Year bonuses in the same little red packets. The packets are often trimmed with gold cord and printed with gold good luck characters. Red firecrackers are used as decorations that ultimately go up with a bang. Fireworks, including firecrackers, are an integral part of the Chinese New Year celebration. There are a number of beliefs associated with the use of firecrackers during the New Year's celebration. One belief is that firecrackers awaken the dragon that will fly across the sky and awaken the rains needed to nurture the spring planting. Another belief is that the noise of the firecrackers will frighten away all evil and misfortune for the coming year. Whatever the reason, children and adults have a great time setting off firecrackers as they celebrate the New Year holiday. Not only do outdoor Chinese New Year decorations embellish streets and houses with red and gold, the red and gold elements are also used indoors to decorate feast tables and walls. Special items, decorated with bright red and metallic gold, are set aside for New Year's celebrations. Even a traditional small gold lion takes a place of pride on this dinner table. Fireworks were originally invented in China and have been a traditional part of the New Year celebration for many years. Firecrackers and other fireworks are used during the obligatory New Year's parades. A fireworks extravaganza fills the sky on the last night of the Chinese New Year celebration. Other celebrations of the Asian new year, such as those in Japan, have many traditional and exciting elements that bring people and their families together to welcome in the new year.